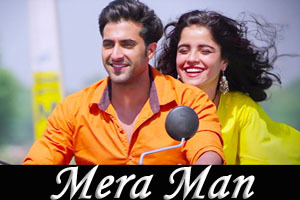 Nice romantic song in the voice of Shiraz Uppal, Kashif Ali featuring Akshay Oberoi, Piaa Bajpai. Star Cast: Randeep Hooda, Akshay Oberoi, Rajniesh Duggall, Piaa Bajpai, Meenakshi Dixit, Shreya Narayan, Rajendra Sethi. Lyrics in Hindi (Unicode) of "मेरा मन"